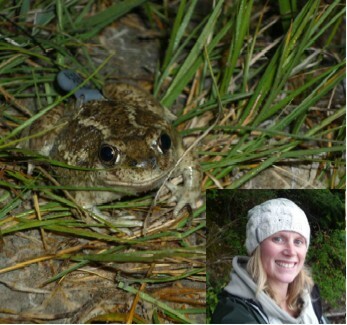 Jocelyn examined the movements and habitat use of the Great Basin spadefoot at newly-identified, extreme northern habitat for the animal. Here, the animals are living in northern grasslands interspersed with forest, a somewhat different habitat association than the dry arid grasslands normally associated with spadefoots. She used telemetry to focus on the movements and habitat use of the animals after they departed from the spring breeding ponds. Roger Packham, a biologist with the BC government, was our partner on this project. See Garner et al. (in press): Modification of the radio-transmitter harness for tracking fossorial anurans. Herpetological Review 46(4): ?? ?- ??? ?